Though it’s been a poor season of roll up the rim to win for myself, my parents managed to snag one of the Garmin Nüvi 250 GPSs. I’m heading on a Canadian coast-to-coast roadtrip this summer and my parents graciously offered their prize to help make sure I don’t get too lost on the way. The 250 is very thin. 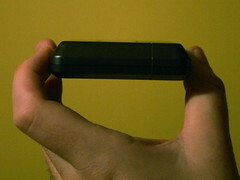 The outside sports an SD card reader, mini-USB port, and power switch. 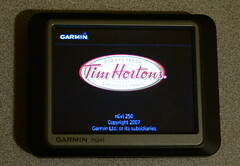 Booting it up for the first time, I was surprised to find that Tim Hortons had gone to the trouble of branding the Garmin with a Tims logo at the start. My roommates joked that it might also have a “Find the nearest Tims” button. We were even more shocked to find that it actually does. According to Garmin, they’ve customized it to include more than 3000 locations. For me, it seems to display the ten or so closest results, the furthest away being 12 km (gives you an idea of the saturation of Tim Hortons in Southern Ontario). It’s a very cool feature, and makes these GPS prizes pretty unique for the winners. 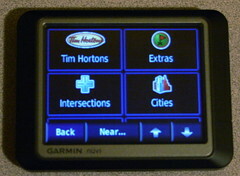 I noticed that plugging the Garmin into my laptop to charge mounted the filesystem, which let me poke around for what makes the Tim Hortons GPS special. As far as I can tell, the main directory has a number of .img files that store the map data. By process of elimination, it looks like the Tim Hortons data is stored in a file called gmapoem.img. This is a known filename for dealer customizations, and a quick look through a hex editor of my copy shows a few “TIM HORT” strings in the mix. Seems like any Garmin owners should be able to get the same “Tims button” by adding the gmapoem.img file. If there are any interested participants, leave a comment and I’ll send you a copy of the file to confirm this. Beyond that, looks like this gadget has a number of avenues of customization and a features I haven’t discovered yet. As interesting things crop up, I’ll be sure to publish my findings.